The specifics of that scenario aren't important, the point is that when you rush work, quality suffers. Good work done late is better than shoddy work done on time. Execute a bureaucrat and their family for each day of delay. Things will be sped up then for sure! Tolerate sloppiness and you will get sloppiness. Right. You'll also get asphalt that was poured in the rain or at the wrong temperature or humidity and sends chunks of rocks onto your windshield in 7 months because it's falling apart. I'm guessing this happened in your area. I've not heard of such a thing. No doubt. But his comment was too specific to be anything other than a personal experience. I thought they were practically done. It shouldn't take months' worth of delays to do only a little bit of work. It's about waiting for a window of good weather. Seattle's winters are consistently drizzly, which doesn't lend itself well to road construction. There's also the matter of giving people and companies time to prepare for the three-week shutdown and the associated disruptions. Metro needs to coordinate extra bus service (during the middle of their own hiring crunch), SDOT needs to prepare for signal re-timings, Amazon will probably deploy some of their own shuttles to West Seattle, the water taxi is going to make extra runs, etc. Then again, you can expect the other three seasons to be drizzly too. Let's just hope that the time is right for the target opening date. 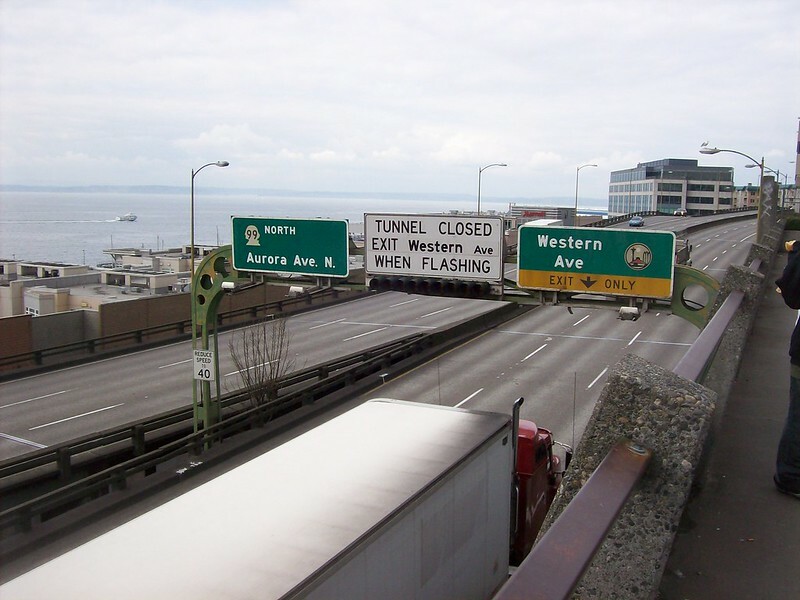 I still think the Alaskan Way Viaduct Replacement Tunnel will be the last deep-bored road tunnel the United States ever builds. How many times are you going to claim this? Until someone bans him for being useless. random question, was SR 99 ever supposed to be an interstate in this area? AFAIK, it never was. I would genuinely be surprised if a direct connection from the viaduct to I-5 was somehow planned, but never materialized. It was planned. The southern section of the viaduct, which has since been demolished, had ramps stubs for a connection to I-5 and I-90. I'm not sure if, after this connection had been built, the viaduct would have become an interstate. But it's more common than not for interstates to end at other interstates, so it's entirely possible. Any updates on the opening? Nope. The early plans for I-5 were drawn up in 1953 (just as the viaduct opened) to cut through downtown but still serve exits and link up to a tollway connecting Tacoma to Everett. This was struck down by the state supreme court a few months after the Interstate program came into being, so it all worked out in the end. The Bay Freeway would have provided a northern connection. Tunnel will open to vehicles after this celebration. I just signed up and got my tickets. I'm looking forward to it! I didn't go to the 520 bridge opening, (I know, I'm such a bad roadgeek) so I figured I ought to go to this one. I signed up. I'm debating about signing up for the bike ride as well. The bike ride's fee goes to fund a lot of great programs run by Cascade, but I'm opting out since I don't have a bike. I did ride in the viaduct run earlier this year using one of the bikeshares, which a dozen other people were doing. LED signals are not particularly common here either. Compare this new signal in Oregon to this new signal in Washington. The Oregon signals are all LED, and appear the same color when not lit. Washington seems to use incandescent signals. Tacoma is the only place that I've seen with full LED signals, and it's only the signals with LED inserts or new wire-span signals, not new mast-arm installs. Are you sure those aren't LEDs on the Washington signal? At least on Streetview the green indication in the NB 3-section mounted on the mast arm shaft looks appears to be more of a clear lens than a tinted lens. Compared to this older signal from Chicagoland with incandescent indications, the Washington signal appears to be using LEDs. There are a lot of Washington installs that are LEDs. Some are using colored drivers, others are using white, with colored lenses. It's not the driver that makes the color. It is a combination of the diodes and, if applicable, the phosphor placed over them. "White" LEDs are usually actually blue LEDs with a phosphor coating on the inside of the cap. I walked around the new Alaskan Way (now to the west of the viaduct, instead of under it), and the whole situation is a mess for pedestrians coming off the ferry. Cross the street and you have to dodge people using the parking lane without the assistance of a signal or any real help. Someone is going to get hit, especially with the darker nights right now.